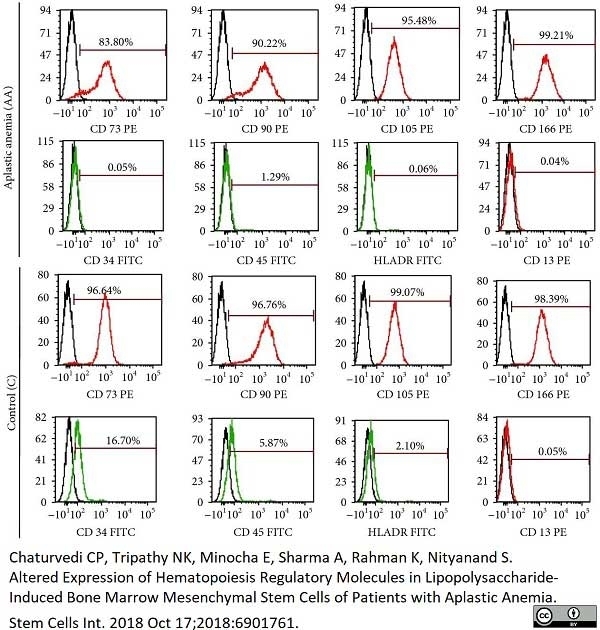 Chaturvedi CP, Tripathy NK, Minocha E, Sharma A, Rahman K, Nityanand S.
Altered Expression of Hematopoiesis Regulatory Molecules in Lipopolysaccharide-Induced Bone Marrow Mesenchymal Stem Cells of Patients with Aplastic Anemia. Stem Cells Int. 2018 Oct 17;2018:6901761. From: Insert article citation with space after colon and Hyperlink to PubMed record. Mouse anti Human HLA DR antibody, clone L243 recognizes the human HLA DR antigen, a member of the MHC class II family, which is expressed by B cells, activated T cells and monocytes. Mouse anti Human HLA DR antibody, clone L243 binds to a conformational epitope on HLA DRα and does not cross react with HLA DQ and HLA DP. Wang, D. et al. (2002) The influence of HLA-DR4 (0401) on the immune response to type II collagen and the development of collagen induced arthritis in mice. J Autoimmun. 18 (2): 95-103. Chaturvedi, C.P. et al. (2018) Altered Expression of Hematopoiesis Regulatory Molecules in Lipopolysaccharide-Induced Bone Marrow Mesenchymal Stem Cells of Patients with Aplastic Anemia. Stem Cells Int. 2018: 6901761.